The Edinburgh Chamber of Commerce is delighted to have secured a fantastic 15% discount offer on the exciting and historic La Reunion weekend. Members can join players and management from the Scotland France 98 squad and will benefit from a 15% discount on a golf team at the La Reunion golf day at Dalmahoy Golf and Country Club on Saturday 9th June. The same 15% discount is available for Members who want to go to the Gala Dinner the following 10th June evening, which is the actual 20th Anniversary of the famous Scotland v Brazil match in Paris on the opening day of the World Cup, a game which thrilled the world. On the 10th of June 1998, Scotland played the biggest football match in the Nation’s history. 80,000 fans in the Stade de France in Paris and a worldwide TV audience of hundreds of millions watched Craig Brown’s Bravehearts play Brazil in the opening match of the France ‘98 World Cup. As Scotland squared up to the then World Champions, no one could have imagined that this squad would be the last Scotland side to qualify for any major championship for two decades. 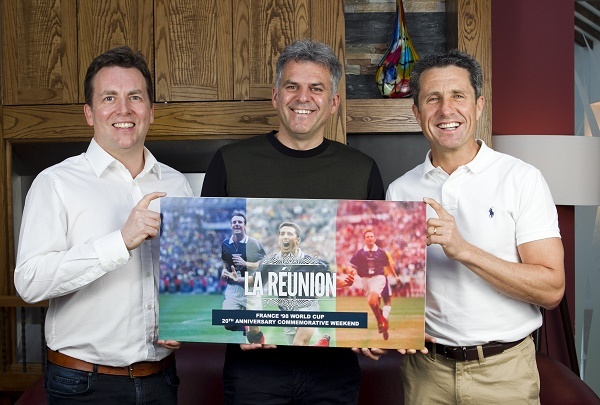 Exactly 20 years to the day of that game, the squad comes together for the first time since the summer of ‘98 for a special ‘La Réunion’ event. You can play a part in the celebrations by teaming up with the legends in La Réunion Golf Day at Dalmahoy Golf & Country Club on Saturday 9th June and then join the players at an incredible Gala Dinner the following evening at Hilton Glasgow. The Golf Day at the renowned Dalmahoy includes a team of 3 golfers playing 18 holes with a member of Scotland’s France ‘98 World Cup Squad on the East or West course of the renowned Dalmahoy Golf & Country Club, Coffee & Bacon rolls & on arrival, post-golf buffet dinner then prize giving with the France ‘98 Squad, commemorative gifts for each golfer, tips & tricks from Professional Scott Dixon. The following day at Hilton Glasgow will enjoy an executive 4 course dinner and a commemorative gift before hearing first-hand – from the players and coaching staff themselves – the incredible behind the scenes tales of playing in the France ‘98 World Cup Finals.